An intensely nourishing, multi-effect moisturizer, infused with Tri-Peptide Complex, to bring out skin that is radiant plumped, supple and more resilient. The Normal/Combination skin creme is silky, refreshing. The Dry Skin creme is lavishly rich. Look as young as you feel. This intensely nourishing, youth-infusing creme brings out skin that is radiant, plumped, supple and more resilient. The advanced Tri-Peptide Complex has been shown by in vitro testing to help significantly amplify collagen by 124% in just 3 days, for skin that looks and feels smoother. 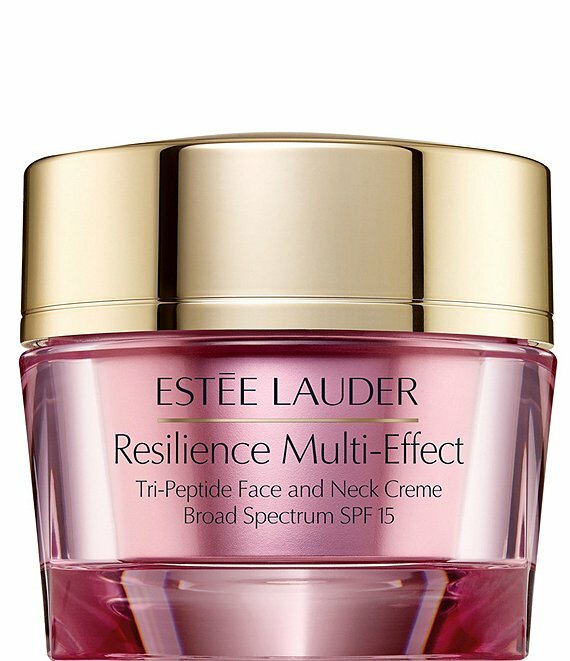 RESILIENT - With broad-spectrum SPF 15 and anti-oxidants, it helps prevent collagen degradation and sagging from environmental aggressors, supporting skin in maintaining its natural firmness and tone. The innovative IR-Defense Technology helps defend skin's moisture barrier against damage caused by infrared rays. NOURISHED - Skin is plumped and radiantly alive. Intensely moisturized all day. 99% of women said their skin immediately felt moisturized, softer and smoother. Apply in the morning after your serum. *Consumer testing on 104 women using the creme for Normal/Combination skin. **Consumer testing on 104 women who used the day creme for Normal/Combination skin in the morning and Resilience Multi-Effect Night at night.